Iranian opposition leader Maryam Rajavi says that Muslim women have an important role in ending repression against ethnic and religious minorities in the Middle East, Circa News reported on Thursday. Maryam Rajavi, the President-elect of the National Council of Resistance of Iran (NCRI) – which has for decades been trying to oust the mullahs’ regime in Iran– says that engaging women in the political process in countries that repress dissent and foment extremism can help push the international community to take action. Tens of thousands of people, including Iranian activists, dissidents and dignitaries, are expected in Paris this weekend for the NCRI’s annual conference, which is expected to have top security in light of recent global terrorist attacks, Circa reported. “The event is aimed at promoting human rights and democracy in Iran and condemning Tehran’s role in supporting the Assad government, which has caused the massacre of hundreds of thousands of Syrians,” the report said. Rajavi knows firsthand the brutality of hardline regimes. She said that six members of her family have been tortured and executed by Tehran’s pro-government forces. “My little sister was arrested. She was tortured extensively, torn limb from limb under torture, until she was finally executed,” she said. And she said more than 120,000 members of her group have been killed. Some of these include members of the NCRI’s militant arm of the group, called People’s Mojahedin Organization of Iran, known as MEK, who for decades have been living in exile in Iraq. During Saddam Hussein’s rule, they were united by a common foe in Iran, and the group was known for providing intelligence about Tehran’s secret nuclear activities it had hidden from the international community. After the U.S.-led invasion in 2003 that toppled Hussein, the MEK members were disarmed by agreement and confined to Camp Ashraf in Diyala province. But in 2009, after the U.S. handed responsibility for them to the government of Iraq, they were later moved from Ashraf to Camp Liberty, a former U.S. military base near the Baghdad airport. Over the years, there have been several attacks on MEK in both camps as the the new government has strengthened ties with Iran. On July 4, shortly after our interview with Rajavi, dozens of people were wounded at Camp Liberty when about 50 rockets struck the camp, setting fire to buildings. 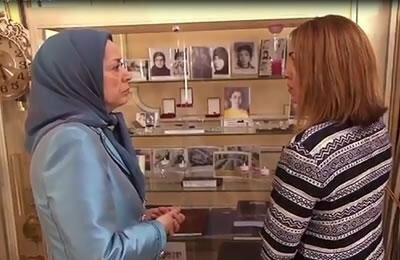 Rajavi said the U.S. has an obligation to protect the refugees at Camp Liberty. In her compound’s garden, bordered by white and purple pansies, she said that she hopes that people inside Iran and in the region will stand up to the regime’s destructive behavior.